FILE - This Oct. 14, 2015, file photo shows the Food and Drug Administration campus in Silver Spring, Maryland. The new drug approved by the U.S. Food and Drug Administration (FDA) on Friday is five to 10 times more potent than pharmaceutical fentanyl and will be used as an alternative to intravenous (IV) painkillers in medical settings. Approval for the drug, which will be manufactured by a California company called AcelRx and marketed under the name Dsuvia, was supported by the Department of Defense. The Pentagon wants to have a pill that it can give soldiers on the battlefield to relieve pain when using an IV is not possible. Critics say the pill could be diverted to illicit use and could worsen the country's opioid crisis. One of the pill's critics is the head of an FDA committee tasked with advising regulators about whether drugs should be approved. This month, in a rare dissent with his committee, Raeford Brown urged the FDA to reject the drug and predicted the medicine would be abused inside and outside medical settings. FILE - In this Oct. 5, 2017 file photo, Scott Gottlieb, commissioner of the Food and Drug Administration, answers a question from a Senate committee examining the federal response to the opioid addiction crisis, at the Capitol in Washington. 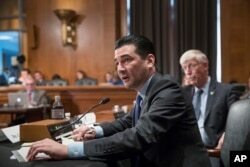 FDA Commissioner Scott Gottlieb said in a statement Friday that there would be "very tight restrictions" placed on the drug's distribution and that the medicine was intended only for supervised settings like hospitals. The drug will not be available in retail pharmacies. Gottlieb also said he would seek more authority for the FDA to consider whether there are too many similar drugs on the market, a move that could limit the number of new opioid drugs approved by the agency in the future. "We won't sidestep what I believe is the real underlying source of discontent among the critics of this approval — the question of whether or not America needs another powerful opioid while in the throes of a massive crisis of addiction,'' Gottlieb wrote. Preliminary figures from a report by the U.S. Drug Enforcement Administration released Friday showed more than 49,000 opioid-related deaths in 2017. That was a rise from the reported 42,249 opioid overdose deaths in 2016. The DEA's National Drug Threat Assessment report shows that heroin, fentanyl and other opioids continue to pose the highest drug threat in the nation. Developers of the new opioid pill say the tablet is placed under the tongue and starts reducing pain in 15 to 30 minutes. It contains sufentanil, a chemical cousin of the fentanyl, which is commonly used after surgery and in emergency rooms. Each pill will come in a plastic applicator that looks like a syringe and will sell for $50 to $60. The FDA says that because of the controls on drugs in medical facilities, medicines rarely get into the hands of general public through hospitals. However, the agency acknowledges that the greatest risk of misuse of such drugs is among medical personnel themselves. Sidney Wolfe, founder of Public Citizen's Health Research Group, said in a statement: "It is certain that Dsuvia will worsen the opioid epidemic and kill people needlessly. It will be taken by medical personnel and others for whom it has not been prescribed. And many of those will overdose and die."